This simple and elegant wedding invitation is an example of a graphics design project completed for a customer who wanted to announce their wedding. The customer had a tight budget and needed an inexpensive solution. When looking at the cost of wedding invitations they were discouraged. Like many customers who are on a tight budget, they tried to make their own home made wedding invitations but they didn't turn out as well as they expected. The wedding invitation pictured above was designed by Hoover Web Design. It was easily created using Microsoft Word and a printer. The heavy cardstock paper for the wedding invitation added a professional touch. The invitation's paper was high quality with raised graphics with hearts on it. Wedding Invitation paper like this can be purchased from an office supply store like Office Max, Office Depot or even Walmart. 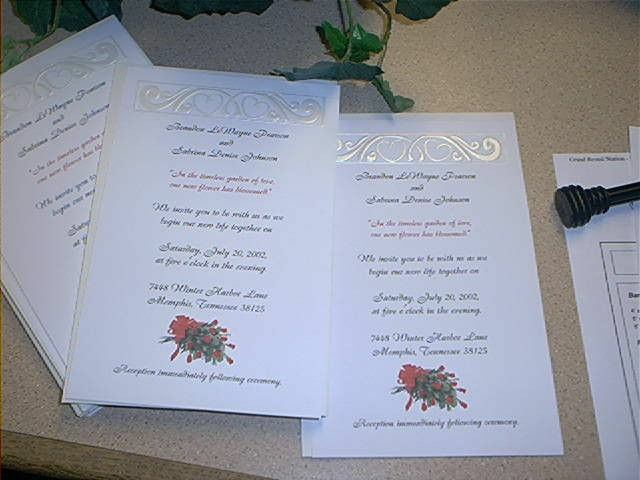 If you are on a tight budget or need discount wedding invitations you should try to make your own invitations. "In the Timeless Garden of Love, One New Flower has Blossomed". Click on the thumbnail image to view details of the wedding web site templates. Be sure to check out our free printables: Free Printable Party Invitation Templates, Free Printable Wedding Invitation Templates, Free Printable Greeting Card Templates, Free Printable Calendars, Free Recipe Card Templates, and Free Printable Resume Templates.